We have developed bindings for the CGAL Polygon_2 class and intersections between 2D objects. The source code is provided in the form of patches against the 0.9.3 release of CGAL-Python. At this time, there are 3 patches available. Patch for the Polygon_2 class. Online documentation is available here. Patch for intersections between 2D objects. This patch is not required and does not add functionality to the library. It is a fix for the makefile of the Kernel module to fix an issue where compilation would fail in machines with limited memory. If applying patches is not your idea of fun, you can grab the patched CGAL-Python 0.9.3 source. 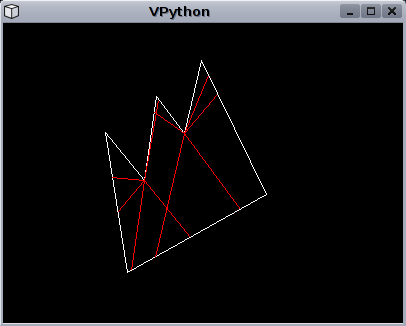 The polygon and intersection bindings served as the foundation to a Python program that accepts a simple polygon and displays the critical constraints of the polygon. The source code of the program is available for download here.